When financing a home with a loan that allows for low down payments, buyers often consider two options: FHA and a conventional mortgage with private mortgage insurance (PMI). Conventional loans with PMI are gaining popularity with new buyers, but FHA still has its advantages. Looking at these loans side-by-side clarifies the potential pluses and minuses of each. 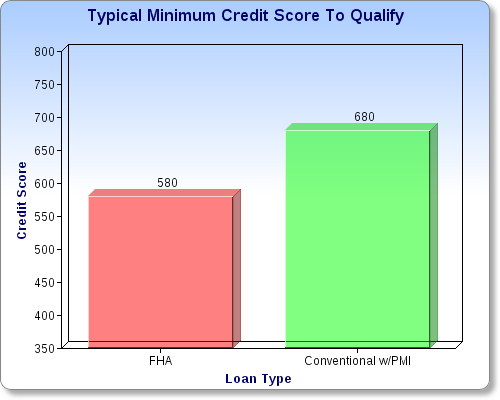 FHA has typically been the mortgage of choice for those that have had less than perfect credit. It’s also a great program for those looking to put as little money into the transaction as possible. In recent years, FHA has been the catch-all for anyone with less than 10-20% down for a home, even those with good credit. But the tide is shifting. FHA has run into financial challenges as it loses money on loans it made to low-credit buyers after the housing bubble burst. Because of its financial situation, FHA is raising its premiums on April 1, 2013. Whereas a 3.5% down loan in the amount at or below $625,500 required an annual fee of 1.25%, it will now require a 1.35% annual fee. That’s an extra $8.33 per month for every $100,000 borrowed. In addition, FHA requires an upfront fee of 1.75% of the loan amount. These extra costs make it less competitive against a conventional loan. FHA will likely continue to become more cost prohibitive as time goes on. Conventional mortgages on the other hand have lower upfront costs and often lower monthly mortgage insurance costs, even when making a small down payment. However, they require higher credit scores and more asset reserves (money left over in the buyer’s checking and savings accounts after the home purchase). Let’s kick the tires of each program and see which one comes out on top. We’ll assume in this scenario that the borrower has a 740 credit score and is buying a home for $220,000. The borrower is a first time home buyer and has sufficient income to qualify for either program. In the case of FHA financing, the borrower would put down 3.5%, or $7,700. With the 1.75% upfront mortgage insurance premium financed into the loan, the total loan amount ends up at $216,015. If we assume an interest rate of 3.5% (APR 4.752) and a 30 year term, the principle and interest payment will be $970 per month. We then add the mortgage insurance premium of 1.35% per year ($243 per month). Add another $300 per month in taxes and insurance, we come out at $1513 per month. Using conventional financing, the borrower would need to come up with a bigger down payment of 5%, or $11,000. Most conventional loan programs require a minimum of 5% down. In addition, conventional rates are a bit higher, so let’s assume a rate of 4.25% (APR 4.959). There is no upfront mortgage insurance premium required for conventional loans, so the loan amount is 95% of the purchase price, or $209,000. The principal and interest payment would be $1,028. The mortgage insurance would be $108 per month, and for estimated monthly taxes and insurance we’ll again assume $300. Total monthly payment for conventional: $1436. This is a savings of $77 per month over FHA, even with the higher interest rate. To get the full picture, we should also look at this scenario in the long term. If we use a time period of say, five years, we see that the savings with a conventional mortgage comes out to $77 x 60 months: $4,620. The FHA scenario requires $3300 less in down payment costs. FHA borrowers can often qualify for FHA more easily with less income and assets. In the conventional scenario the borrower ends up with a loan amount that is $7,015 lower than the FHA option. The conventional borrower can often cancel the $108 mortgage insurance payment when 20% equity can be proven with a new appraisal. 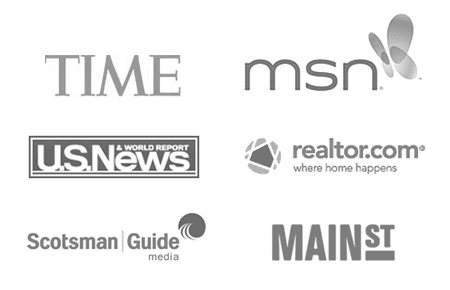 Starting June 3, 2013, FHA will require monthly mortgage insurance for the life of the loan. Borrowers with great credit, good income, and money in the bank should seriously consider using a conventional loan over FHA. For this type of borrower, it doesn’t make a lot of sense to incur the extra expense of an FHA loan. However, borrowers who have had credit issues in the past or have limited assets may qualify for FHA financing only. After all, the FHA loan program exists to allow people to buy homes who normally wouldn’t be able to. 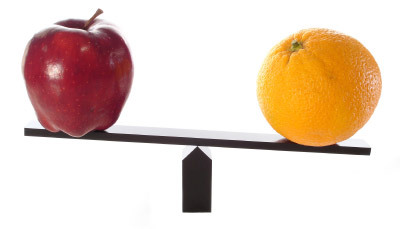 Talk to your mortgage professional to determine which option is better for you. If you qualify for both loan programs, have him or her draw up personalized scenarios taking into consideration initial costs and ongoing costs. With your two options in black and white, you’ll be able to make a great educated decision whether FHA or conventional financing makes the most sense for your home buying goals. All scenarios assume $5000 in finance charges, single family residence, 740 credit score. Taxes and insurance costs are estimated. Interest rates and private mortgage insurance rates based on rates available on 2/27/13. 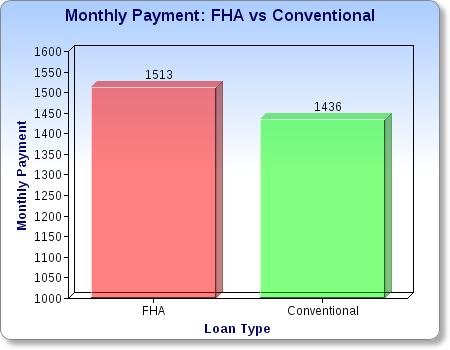 FHA MMI based on rates to go into effect on 4/1/13.